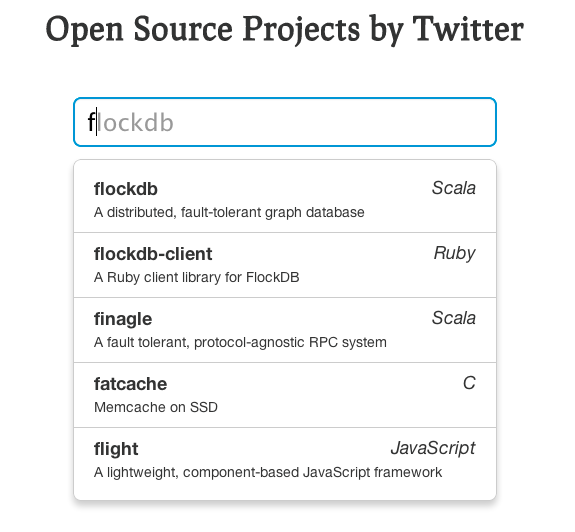 Twitter typeahead.js is a fast and battle-tested jQuery plugin for auto completion. Today we’re open sourcing the code on GitHub under the MIT license. By sharing a piece of our infrastructure with the open source community, we hope to evolve typeahead.js further with community input. It’s also optimized for large local datasets, so it’s fast for high-latency networks. You can also combine local or prefetch with a remote fallback for the performance of local data combined with the coverage of a remote query API (e.g. quickly search your friends but be able to find anyone on your site). There are lots of options for configuring everything from ranking, matching, rendering, templating engines, and more; check out the README for those details. We initially built typeahead.js to support our needs; now we look forward to improvements and suggestions from the community. To learn more about how typeahead.js works, check out our detailed documentation. To stay in touch, follow @typeahead and submit issues on GitHub. Also, if building web application frameworks like typeahead.js interests you, why not consider joining the flock? Typeahead.js was primarily authored by Tim Trueman (@timtrueman), Veljko Skarich (@vskarich) and Jake Harding (@jakeharding).